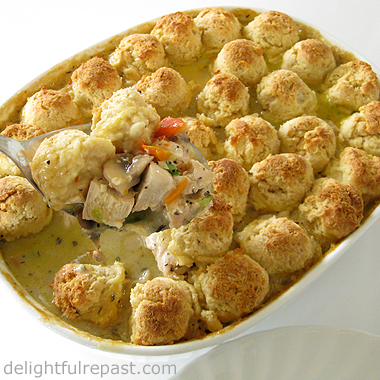 Chicken Cobbler - Chicken Pot Pie with Gluten-Free "Cobbles"
Calling all gluten-free cooks: I need your help! Though this chicken cobbler was fine just the way it was, it would have been fabulous had the sauce stayed as thick after baking as it had been before it went into the oven. It seems some of the gluten-free starches thin out at some point in the baking. 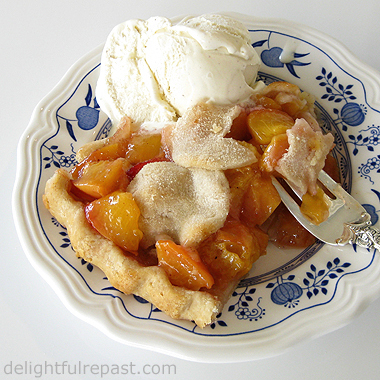 I used tapioca flour, which works perfectly in my fruit pies, and the sauce became much thinner during its time in the oven. Any suggestions? I usually put an all-butter flaky pastry crust on my chicken pies, but I had a package of gluten-free biscuit mix on hand and was eager to try it. That's when I thought of cobbles. Looks pretty cute, huh? Tasty, too. And the topping, as well as the filling, reheated well the next day. I love leftovers! 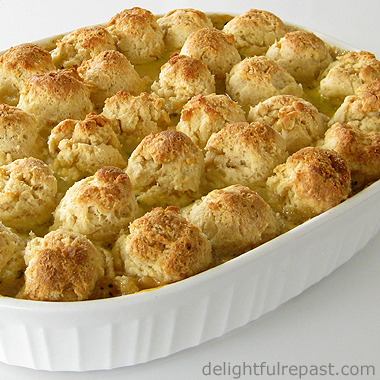 Of course, it's easy to make gluten-free biscuits (though I haven't posted my recipe yet). If you're not gluten-free, you can use one of these biscuit recipes for the topping: Homemade Biscuits or Buttermilk Biscuits Made with Buttermilk Powder. A gluten-free diet has (at least, so far) not done for me what I had hoped it might, but I'm going to stick to it for the entire month. If I don't notice a difference by the end of the month, perhaps I'll try a dairy-free month next. But I'll continue to develop the occasional gluten-free recipe for friends. So do, please, give me your gluten-free tips in a comment below. 2 In same skillet, melt butter and saute onion for 3 minutes, scraping up the brown bits from cooking the chicken. Add bell peppers; saute for 2 minutes. Add mushrooms and 1/4 teaspoon of the salt and pepper; saute for 5 minutes. 3 In a small bowl, stir the tapioca flour and broth to a smooth slurry and stir it into the vegetables. Stir in the cream and sherry; cook, stirring constantly, until bubbly and thickened. Season with remaining salt and pepper. Remove from heat. Stir in the chicken and, if using, the peas. Adjust seasoning. 3 Pour into 1 1/2- to 2-quart baking dish (such as the CorningWare French White 1 1/2-Quart Oval Dish pictured above--I love that dish, have used it several times a week for many years). Preheat oven to 375 degrees. 4 In medium bowl, add butter to baking mix. With your fingers or a pastry blender or two knives, cut in the cold butter until the mixture looks like coarse crumbs with some bigger chunks remaining. Pour on the milk and gently mix until just combined. 5 Using a #60 (1/2 ounce / 1 tablespoon) scoop to form "cobbles," scoop the dough onto the chicken filling. Wetting the scoop from time to time will make the dough release more easily. Bake at 375 degrees for about 30 minutes, or until topping is golden and filling is bubbling. Mmm ... just pulled a batch of scones out of the oven to have with a nice cup of Earl Grey for my elevenses today. Of course, I usually have elevenses around nine or ten o'clock since I start my day so early! These scones are gluten-free because I'm going gluten-free for the month of July. I have a freezer full of different gluten-free flours and starches, and this combination is one I especially like for scones. There is only the slightest difference in texture from my regular scones, a difference so slight most people don't even notice it at all. I make what I call my Classic Scones when I happen to have buttermilk on hand. But more often, because I hate buying a quart of buttermilk and having most of it go to waste, I always keep a supply of buttermilk powder (Organic Valley Buttermilk Blend) in the pantry. It makes scones that are every bit as good as those made with fresh buttermilk. For an afternoon tea party, I serve scones with three accompaniments: raspberry or strawberry jam, lemon curd and clotted cream. For elevenses, I have them plain; the orange zest and dried fruit are embellishment enough. 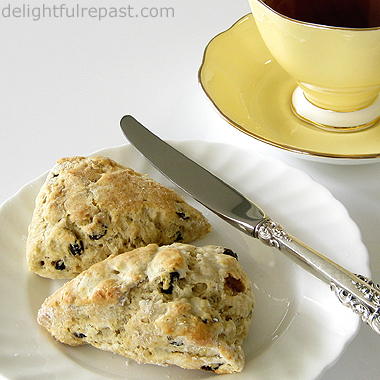 Do you have a favorite scone or other treat to go along with a cup of tea or coffee? Update 08/02/18: For a tutorial, complete with step-by-step photos, go to Classic Scones - Traditional Scones - A Tutorial. 2 In a wide 2-quart bowl whisk together the flours,* xanthan gum, sugar, buttermilk powder, baking powder, baking soda and salt. With your fingers or a pastry blender or two knives, cut in the cold butter until the mixture looks like coarse crumbs. Stir in orange zest and dried fruit to coat and separate. * While you're measuring out the three flours/starches, measure out and whisk together 2 tablespoons each sorghum flour and potato starch and 4 teaspoons tapioca flour to use for shaping the scones. 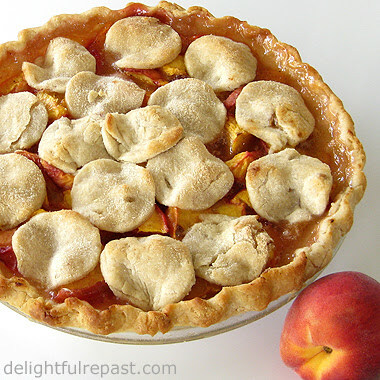 Use a bit of it to sprinkle lightly in two 6-inch rounds on the parchment-lined baking sheet. 3 In small bowl, combine water, egg* and vanilla; pour into dry mixture and gently mix until just combined. Right in the bowl, divide the dough into two portions. * If you prefer to glaze the tops of your scones, beat the egg lightly and reserve one tablespoon to mix with a teaspoon of water to brush on just the tops of the scones right before baking. I prefer to brush the tops with a little milk. 4 Scrape the two portions of dough onto the floured parchment and, with floured (gluten-free, of course) hands, gently pat the dough into two 6-inch rounds. Cut each round into 8 wedges. Pull the wedges away from the center and separate them to about an inch apart. 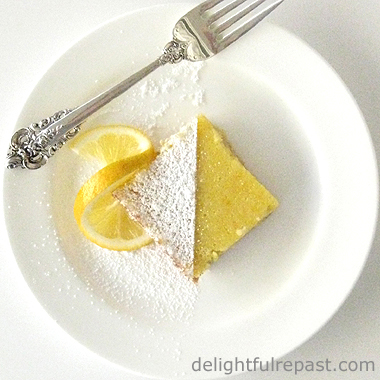 A small offset spatula dipped in flour works well for this. 5 Brush just the tops of the scones with either the egg glaze or a little milk. Bake about 13 to 15 minutes until golden brown. Note: Scones may be frozen, double-wrapped, for up to one month. Thaw at room temperature, wrapped. To reheat room temperature scones, wrap loosely in foil and heat at 300°F (150°C / Gas Mark 2) for 10 minutes.